· INCLUDES LARGE ORIGINAL POSTER IN BEAUTIFUL CONDITION. · MONO version of this album has NEVER been available on legitimate Compact Disc or in any other digital format. In March of 1968, Robert Kennedy was still alive and offering a vision for a way out to the America that had deeply entrenched itself in the Vietnam War. The inner-city rebellions in 1967 had shaken the youth culture's image of their own summer of love in that year. The beginning of America's crippling identity crisis had begun to shudder through the culture that would erupt with the death of Kennedy later that spring and the tragedy of the Democratic National Convention in Chicago later that summer. Before it was all over, Martin Luther King, Jr. had also lost his life. In pop culture, rock was exploding everywhere in Western culture. The impact of the Beatles' Sgt. Pepper's Lonely Heart Club Band and the Beach Boys' Pet Sounds -- both made in 1966 -- and the appearance of Jimi Hendrix on the pop scene in 1967 had ushered in a new way of making records, a way that not only referred to and portrayed everyday life but was part of its acceptance for what it was before attempting to transcend it. Earlier that spring, Simon and Garfunkel had slipped their fourth album into the bins with a whisper, the confoundingly literary, profoundly poetic and stunningly beautiful Bookends. As a pair, the two were seemingly equal collaborators with producer and engineer Roy Halee on a highly textured, multi-layered song cycle that offered observations on everything from urban crises that were symptomatic of larger issues, the prospect of old age and death, the loss and dislocation of those who desperately wanted to inherit an American Dream but not the one offered to them, surreal yet wistful reflections on youthful innocence lost forever to the cold winds of change. Bookends is a literary album that contains the most minimal of openings with the theme, an acoustic guitar stating itself slowly and plaintively before erupting into the wash of synthesizers and dissonance that is "Save the Life of My Child." The uneasy rock & roll that carries the song through its disaster and the revelation of "Oh my grace, I've got no hiding place," which is the mere hint of what is to come in this wide open terrain of the previously familiar but completely unknown. The classic "America" is next, a folk song with a lilting soprano saxophone in the refrain and a small pipe organ painting the acoustic guitars in the more poignant verses. The song relies on pop structures to carry its message of hope and disillusionment as two people travel the American landscape searching for it until it dawns on them that everyone else on the freeway is doing the same thing. Its sweetness and sophisticated melodic invention are toppled by the message of the song and it becomes an ellipsis, a cipher, turned back on itself into disappearance, wondering what question to ask next. The sound of a lit cigarette is the opening of "Overs," a balladic study in the emptiness at the end of the relationship. The sound of inhaling and exhaling of the smoke tells the entire story. Also woven into the mix is a two-minute field recording of the voices of old people made by Garfunkel, collected from nursing homes and centers for the aged. The disembodied voices are chilling and heartbreakingly beautiful in their different observations, entire lifetimes summed up in a few seconds. This interlude leads into "Old Friends," which carries the message deeper as the image of two old men sitting on a park bench in languid statements of life lived ordinarily but poetically share not only their memories but also the commonality of their fear. A horn section threatens to interrupt the reverie, carrying the chaos they feel, their lack of control over current events, but is warded off as denial and the gentleness of the melody returns and fades into the album's opening theme, suggesting that we preserve our memories. As "Fakin' It" kicks to the fore, we feel the separation inherent in Simon's generational view of the unconscious separation of heart and mind. The tune is as full of hooks as a fishing boat and Halee swipes a bit from the Beatles' "Tomorrow Never Knows" and eases orchestral layers into the mix, subtly of course, but ever-present and recognizable nonetheless. With "Fakin' It," the depth of the album's meditation presents itself in earnest. Synth lines and handclaps give way to snare drums and acoustic guitars, and the first appearance of loss shows itself for what it is, the passing of life, moment by moment, memory by memory so quickly, that pretending is somehow preferable to the reality of everyday life. When the horn section and strings bring the crescendos and the lyric asserts, "This feeling of fakin' it/I still haven't shaken it/I know I'm fakin' it/I'm not really makin' it." Even Leonard Cohen's dark prophecies never stated the case so plainly -- in a folk-rock tune. The identity crisis inherent in the jazzy "Punky's Dilemma" melds the loss of innocence and childhood with the cynicism of present-day living. The final four tracks of the original album, "Mrs. Robinson," the theme song for the film The Graduate, "A Hazy Shade of Winter," and the album's final track, the George-influenced "At the Zoo," offer as tremblingly bleak a vision for the future as any thing done by the Velvet Underground, but rooted in the lives of everyday people, not in the decadent underground personages of New York's Factory studio. But the album is also a warning that to pay attention is to take as much control of one's fate as possible. That S&G never overstate the case here, never preach to the converted but instead almost journalistically observe the questions in the process of their being asked is a monumental achievement. That they did so in three- and four-minute pop songs is almost inconceivable for the time. For its extraordinary contribution to the modern music, superb production, craftsmanship, fine musicianship, revolutionary significance and influence it exerted on numerous generations of musicians, writers and general public, or for some other innate quality, this album was voted one of top-200 albums of all time in one of the largest poll of critics, music reviewers, professionals and producers ever organized: the poll, which was conducted by Paul Gambaccini, legendary BBC Radio A&R man, surveyed more than 50 top music professionals (including Roy Carr, Jonathan Cott, Robert Christgau, Cameron Crowe, Chet Flippo, Ben Fong-Torres, Charlie Gillett, Greil Marcus, Murray the K., Lenny Kaye, Bruce Morrow (a/k/a "Cousin Brucie"), Tim Rice (of "Jesus Christ Superstar" and "Evita" fame), Lisa Robinson, Robert Shelton (who wrote liner notes for Bob Dylan's first album), Ed Ward, Joel Whitburn, Pete Wingfield, etc.). For more details, see: "Critics Choice: Top-200 albums" compiled by Paul Gambaccini, Omnibus Press, Library of Congress Catalog No.7855565 (or ► for the complete album listing). (b) WE GRADE SIDE 2 THE VINYL AS STRONG VG++. A few light abrasions ARE VISIBLE on this side, but they appear fairly insignificant relative to the overall condition of the vinyl, and are only moderately visually distracting. For most part, the vinyl looks impeccable, without any MAJOR visual flaws or imperfections. Much of the original luster is intact, and the vinyl shines and sparkles almost like new. 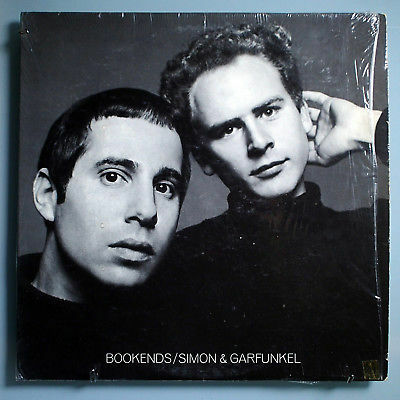 (c) The album comes with the original full-sized color poster of Simon & Garfunkel (in a beautiful condition; only minor yellowing noted). - Cover shows JUST A HINT of yellowing on the front side, apparently from aging. Jason Aldean EXCLUSIVE Old Boots, New Dirt [LP] (Vinyl 2014) NEW! SEALED!